Ladies and gentlemen, I bid you once more welcome in my lounge! Please, do take a seat, as I want to show you a thing most intriguing; surely, you recall the little pieces of intangible ephemera that we tend to conjure to diversify the experience of engaging in the Great Game? Well, this little booklet now, for the first time, compiles these ephemera, while, as I was told by my servants, also getting rid of some of the minor imperfections previously noted by astute dignitaries, personas and individuals of staunch character and stellar pedigree. At 48 pages, 4 less once you subtract covers and similar components, we have a rather hefty little tome. Oh yes, I wholeheartedly concur, my dearest. As you can see after reading Tom Olam’s introductory text (which is situated, mind you, on the page denoting the contents), the entrepreneurs that so charmingly self-depreciatingly style themselves “Fat Goblins” have not simply stitched magically the contents of our beloved ephemera together; nay, I say! They, as befitting of the care and respect due our pastime, elected to redesign the formal presentation of materials within, employing a wide cornucopia of artistry, ranging from the thematically-suitable artworks (which, it should be added, could be at home in a proper salon such as this!) to the presentation of the pages themselves: Unobtrusive, yet gorgeous aesthetics render the book a balm for sore eyes, not unlike all those looking upon me and/or reading these lines right now. 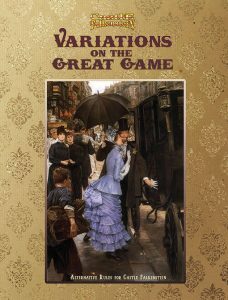 But I digress; we begin our discussions within with a further look regarding specializations and their interactions with abilities; particularly useful for debutantes in the Great game would be the explanation of the lexicon employed by our most civilized of pastimes. It should also be explicitly mentioned that a previously slightly ambiguous component accompanying the implementations of specializations in the Great Game has been done away with: The booklet now explicitly notes that extraordinary abilities are exempt from specializations – a decision that rings as sensible to me, considering that they are already designated as extraordinary, n’est-ce pas? A table of the most useful kind indeed is provided here, providing the tools to implement these in conjunction with all of our favorite elaborations and expansions of the Great game – criminally few though there may be. More steeped in tradition, though not necessarily *our* tradition, but tradition nonetheless, would be the suggestion to employ “improvement points” to determine the growth of a dramatic character; as you all are well aware, this steeps the progress gained very much in a literary tradition regarding the journey and growth of a dramatic character. As the profane rabble would call it, “experience points” or some such nonsense, though they are still kept very much in service to the demands of proper etiquette and narrative sensibilities. As such, I have no qualms about recommending these to hosts to so inclined – there even are suggestions presented for various growth velocities. Awareness of the, at times, almost incredulous feats accomplished in our Great Game, is expected at this point; but, as well all know, when paraphrasing an adage by Hardy, “there ought to be sympathy for the less fortunate.” Or at least, that’s what my maid used to tell me the other day. Anyways, as you are well aware, the experience of those less fortunate than ours, who are living a life less characterized by adventure and great deeds as providence foresaw for us, might well be intrigued to play when given the chance; heck, we might well want to step back ourselves and be immersed in a scenario or two where we are not as…impeccably extraordinary. As such, imposing a hard limit on cards played serves as a truly fantastic way to envision a world that is, at least slightly, more mundane than the at times tiringly wondrous lives we lead. What’s that, James? Ugh, tell the faerie I want the yard clean for the late afternoon tea. Pardonnez-moi, mesdames et messieurs – good help is so hard to find these days. Now, when recalling, as individuals of such astute faculties undoubtedly can, the Half-Off variant is pretty self-explanatory, focusing on providing half the benefits when cards do not align…like that of my fate and that splendorous debutante last year…And yes, at this point, I should not be remiss to note that the variations presented within actually can be modified and tinkered with further. Think of them like the intricate wheels of a proper clock – they run just fine on their own, but depending on your joyous curiosity regarding experimentation, you’ll have different experiences. Perhaps one of the most vital variations ever devised upon this wondrous world, though, would be the finer differentiation between Feats difficulties that one of these provides; this one, all on its own, should easily make the truly paltry price, respectfully asked, truly worth it, and it frees the host from the requirement to play cards to enhance difficulties – in short, it enhances the fair play at a table by taking a needlessly divisive burden off the host’s back, while also enhancing the gravity of the decisions made by dramatic characters. Now…I’d ask those of faint dispositions, those of weak hearts, to leave the room. The fairer among us may want to take out there fans, for yes…it is my outraged duty to report that the most scandalous dice-based variation, devised by the mischievous, malignant Moriarty, is also included within this booklet! The criminal mastermind’s attempted subversion of our proper world order seems to be alive and kicking, and while obviously despicable and dastardly, one cannot help but find a sick genius in the implementation of these rules. While obviously worthy of shunning and prosecution, one must be able to look into the eye of savagery, even in the variations, imposed in this case, upon the Great Game. Now, unflinchingly, I have to concede that there is a well-based foundation underlying this, but now that I have determined this, none of you will have to. If I may, ladies and gentlemen – keep this variation out of the hands of savages, staff and similar beings of less firmly-grounded morals. We don’t want them to feel entitled to play in our grand pastime now, do we? As you may know, this series of ephemera started with a humble little offering, highlighting how one of these decks, these Tarot cards, that are all the rage right now, may be employed with the Great Game; success bred…more success. Like our family trees, correct? We did, hence, get more than one of these ephemera, which have since been properly fitted with a more evocative nomenclature, namely that of the Fortunate and that of the Sorcerous Tarot Variation. If you, like me, love to regale your astute audiences as a host, then the following happenstance may well have occurred in your game as well: You have the Major Arcana…and its effects simply would not fit properly. Quel dommage! Now, it seems like some distinguished individuals, who shall not be named for now, have observed this as well, and thus proceeded to alter the tables of the effects of these types of cards, making them more widely applicable. While it is my firm assertion that a host of the proper caliber would not require this modification, I couldn’t help but marvel at the simplicity of the modifications added to the material at hand. Speaking of which, this book does also note an option that can combine our classic deck with major arcana, and one that would allow for the discarding of a major arcana card to redraw – this one, ladies and gentlemen, obviously does vastly enhance the power and versatility of dramatic characters. If you want to weave a truly outlandish yarn, this may well be the way to go! Now, as noted before, the aesthetics of this booklet do not leave anything to be desired; there are these little bookmarks included for ease of navigation in the ephemeral iteration of this booklet. The compilation and refinement exerted throughout combine to make sure that these variations, transcribed by the esteemed Mister J Gray, is a masterpiece, pure and simple; had it not been for the fact that I have already bestowed my highest accolades upon the components, this would have been a candidate for my list of best offerings of the year. Since this already has reached these heights, I am in the unfortunate position of not being able to bestow these honors once more. This, however, should not be taken to mean that this is anything but a truly required purchase – this humble offering should be considered to be an EZG Essential, a required reading for any host of distinguished character and skill, a 5 star + seal of approval supplement. You can get this inspired compilation here on OBS!